Happy last fri-yay of the month! 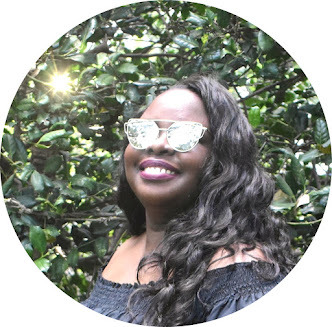 I'm always looking for new beauty and skincare products to try. I really want to try products from Glossier, Drunk Elephant and Rodin. I picked five products from each brand that I'm anxious to try out and wrote a little summary about them and why I want try them out. Check my picks below. Glossier Boy Brow - This brow gel claims to be a all-in-one brow fluffer, filler, and shaper. On a lazy day when I don't feel like taking the extra effort to do my whole brow routine I think this would be a great alternative. The creamy wax formula claims to provide a soft and flexible hold that doesn't flake. Glossier Balm Dotcom - This multipurpose lip and skin salve is packed with antioxidants and natural emollients that are supposed to nourish and repair dry or chafed skin. I really like the birthday balm because of the subtle simmer it would give my lips. 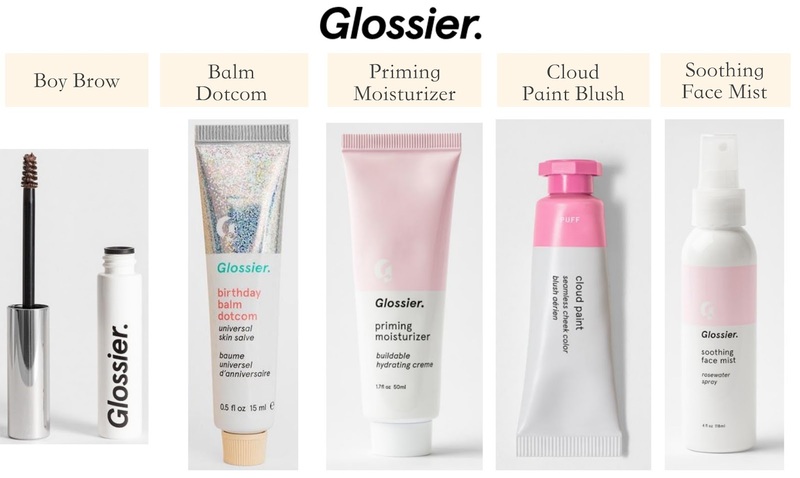 Glossier Priming Moisturizer - I love a good primer it makes the makeup application process so much easier. This primer claims to visibly plump skin and moisturize while minimizing the appearance of pores. Its appropriate for all skin types and is supposed to even skin tone and leave your skin with a dewy finish. Glossier Cloud Pain - I love the packaging of this blush. This gel cream formula is designed to be a easy to use cheek color that you can simply dad onto your cheeks. I like that the blush is sheer and buildable, you can add as little or as much as you like. Glossier Soothing Face Mist - Made with roses and aloe this face mist is supposed to help soothe, hydrate and leave you skin feeling fresh and awake. The mist can also be used to refresh your makeup. Drunk Elephant Shaba Complex Eye Serum - Shaba complex contains black tea ferment and copper peptides that are meant to work together to give a firmer looking appearance around the eyes. As I have gotten older I've noticed the skin under my eyes getting darker and maybe a little thiner, I'm hoping this eye serum will help with that. You gently apply the product under and around your eyes to help you look more youthful and radiant. Drunk Elephant T.L.C. Sukari Babyfacial - This at home facial product thats meant to be used once a week contains 25% AHA and 2% BHA. The combination of acids exfoliates your skin to improve skin texture and tone. The product is appropriate for all skin types and claims to dramatically smooth texture, minimize fine lines, wrinkles, and pores. I'm hoping this product can help smooth away my large pores around my nose area. 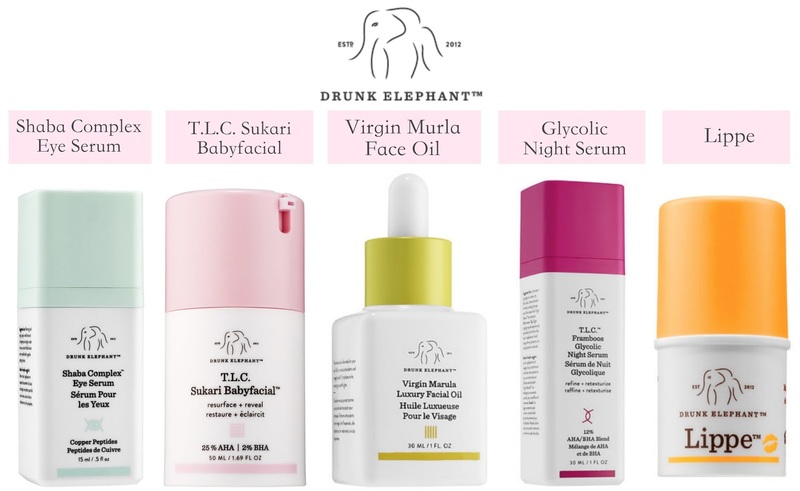 Drunk Elephant Virgin Marula Luxury Facial Oil - I love a good facial oil, this cold-pressed oil is packed with vitamins and antioxidants to help to moisturize and nourish skin. You can add the oil to your face, neck, or any place on your body to increase moisture with out any greasy residue. I'm hoping this oil can help with my extra dry skin. Drunk Elephant T.L.C. Framboss Glycolic Night Serum - With 12% AHA/BHA this night serum is supposed to refine and resurface skin to help reveal smoother and more radiant complexion. The product claims it removes dead skin cells with its blend of formulated acids and extracts. You apply at night to clean and dry face, neck, chest, and backs or hands. Drunk Elephant Lippe Balm - This moisturizing and volumizing lip balm is supposed to help nourish your lips to give them a plumper look. I'm a sucker for lip products, I like that its formulated with avacado, cranberry and marula oils. I tend to have dry lips so anything that claims to replenish, hydrate, and soften my lips is right up my alley. Rodin Lip Balm - This all natural and sheer lip balm combines jasmine, orange flower oil, shea butter, beeswax, and castor seed oil. I love the lucite square compact packing of this Rodin product (its literally the main reason I want it). The lip balm claims to make your your lips look smoother and more supple, two things I love! Rodin Geranium & Orange Face Oil - This lightweight face oil claims to nourish, soothe, and rejuvenate your skin. Containing geranium oil from South Africa and orange blossom absolute fro Morocco, the face oil is supposed to leave your skin complexion radiant and supple. Rodin Lipstick "Billie On The Nike" - I also love the packing of this lipstick, I want to collect all five shades! This creamy and matte lipstick in infused with the same oil blends found in the Rodin skincare products. 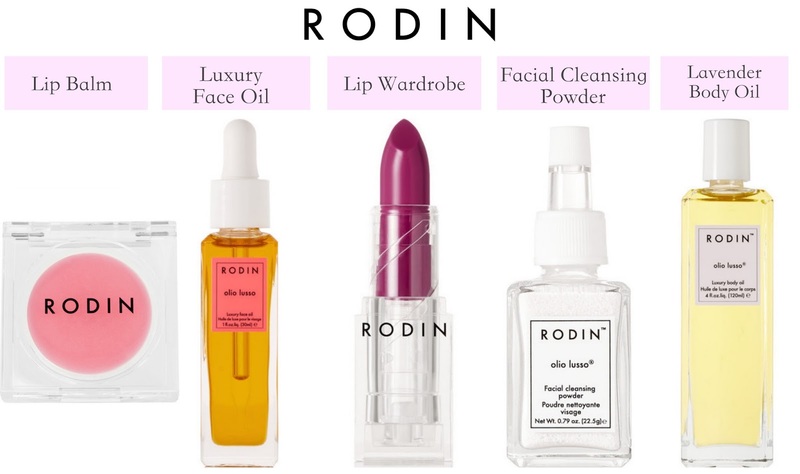 Rodin Facial Cleansing Powder - Probably the most unique product in this whole wishlist is this cleansing powder. This water activated powder that contains granular rice bran, sea algae, jasmine and neroli oil gently exfoliates for softer skin. Instructions say to pour a small amount of the powder into your damp palms, lather, massage over face, and then rinse. Suitable for all skin types the cleanser claims to smooth your complexion and improve elasticity. I super curious to try out this cleanser it looks like it would be interesting to use. Rodin Lavender Body Oil - Made from the stem and flower of lavender, this body oil blend says to offer calming olfactive skincare benefits. I love the soothing effects of lavender I think this oil would be best used after taking a shower at night right before bed, to help lull you to sleep.